Member-at-Large: a member of the Society who is not a member of a local bailliage. Bailliage Member: A member of the Society who is a member of a local bailliage. National Council Member: A member of the Society who is a member of the National Council. The National Council is made up of national officers, certain regional officers, and the Bailli of each local bailliage. Members are further classified as professional or non-professional. Non-professionals normally enter with the rank of Chevalier or Dame de la Chaîne (except for those below the age of 35 who may enter as Ecuyers). Professionals enter with a rank based on their occupation or training. Each member of the Chaîne des Rôtisseurs is awarded an appropriate ribbon, denoting rank, when he of she is inducted or promoted. Chaîne members are proud of their ribbons and enjoy wearing them! Members should wear their ribbons at all Chaîne events unless noted. Not only do members then stand out from guests, but knowledgeable members can tell ranks apart by noting the colour(s) of the different ribbons. Those selected to be officers wear special ribbons, with the color designating either operating (green) or administrative (blue). Officers’ ribbons are sometimes edged with braid. Gold braid indicates national service, silver braid indicates regional, and no braid indicates local. Regular Members: Members may be elevated to Officier after a minimum of 5 years service at the Bailli’s request or after 10 y ears service at the request of the member. Those who serve as bailliage board members, but do not hold blue ribbon offices, may be elevated to Officier after two years service. Professional Members: A professional member may be elevated to the rank of Officier after 10 years of membership and active participation in the development of the Chaîne. After 10 years as an Officier rank holder, and deserving further recognition because of outstanding service, a professional member may be awarded the rank of Grand Officier by the National Board of Directors. 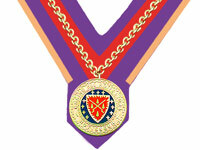 Special Ranks: All members who have maintained membership in the Confrérie for 20 years will be awarded the rank and badge of Commandeur, for 30 years that of Officier Commandeur, and for 40 years that of Grand Commandeur. 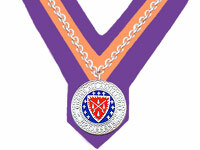 For unique service to the Chaîne, the National Board of Directors may award the rank of Pair. 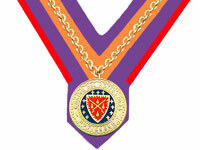 Honorary ranks of Chevalier d’Honneur and Maître d’Honneur may be awarded by the Bailli Délégué to individuals of national prominence in their field. Badges have been designed in two versions, with the standard version indicating that the officer is serving actively and the version with the laurel wreath indicating that the officer is no longer serving actively. In general, every officer should wear only one badge. Present office takes precedent over an honoraire position. As an example, someone formerly a Bailli but now serving as Vice Conseiller Gastronomique should wear the Gastronomique badge on their green ribbon. The badge tells what their function is now, the ribbon the post they formerly held. When that person retires as Vice Conseiller Gastronomique, they should then replace the Gastronomique badge with the Bailli Honoraire badge. 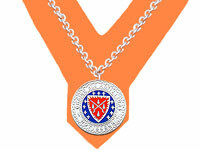 Badges have been developed to help members differentiate among professional members. For example, hotel and restaurant managers have different badges. There is a distinctive badge for the Professionnel du Vin, a member involved in viticulture, producing wine or spirits, or selling such products. There is also a distinctive badge for the Professionnel de la Table, a member directly involved in the growing or raising of foodstuffs or in the production, sale, or distribution of culinary items. Those connected with cruise lines have their own specially designed badges. A The Nameplate should be worn mounted across the chain on the right side of the Chaîne ribbon near the top of the chain. 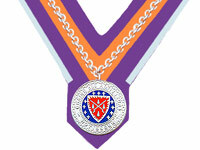 B Badges of Office to designate local, regional, and national officers, active or honorary, should be worn on the left side of the Chaîne ribbon about half way down the chain and outside of the chain. 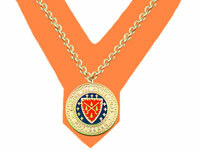 Professional Badges further reflect professional ranks and should be worn in the same position as Badges of Office. When both are worn, the Professional Badge is worn beneath the Badge of Office. D The Commandeur Pin should be worn mounted across the chain on the left side of the Chaîne ribbon near the top of the chain. 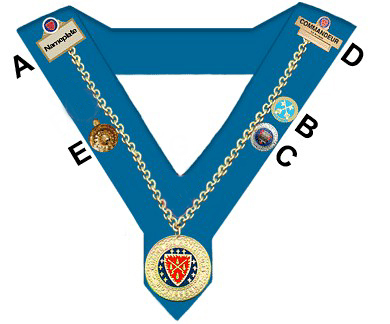 E The Ordre Mondial Tastevin should be worn on the right side of the Chaîne ribbon about half way down the chain and outside of the chain. Event pins are fun to collect and wear, particularly those of recently attended events, but be sure they don’t crowd important badges. At the local and regional levels, two special awards may be awarded. The Bronze Star of Excellence and the Mondial Bronze Medal may awarded for outstanding service by a Bailli once a year and by a Bailli Provincial to someone in his or her region once a year. 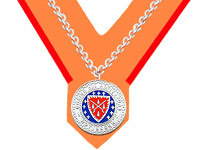 Silver and gold Chaîne Stars of Excellence and silver and gold Mondial Medals may be awarded for outstanding regional or national service by or with the permission of the Bailli Délégué.